With the next hearing of the ongoing legal battle at Supreme Court over the melting of the century-old caparison of Tripunithura Sree Poornathrayeesa Temple slated for late September, the temple `thanthri’ (priest) has alleged that the Cochin Devaswom Board (CDB) was involved in the `conspiracy’ to melt the old caparison along with scrap to make the new one. “Strict instructions are there in the temple manual regarding the handling of precious ornaments used for the presiding deity of the temple,“ said Puliyannoor Anujan Narayanan Namboothiripad, temple thanthri. The formal consent of the `thanthri’ is essential for altering or remoulding any holy ornaments used for decorating the presiding deity , he said. But the CDB had neither sought his consent nor invited him for the crucial meeting in July last, which took the decision to melt the age-old caparison, he said.He also contested the official version that the purity of old gold caparison was poor.“The erstwhile Kochi king had sold 14 gold caparisons for funding the extension of Shoranur railway line to Kochi, leaving one, the 15th caparison. This is the holiest among the 15 as it is used for the tusker carrying the `thidambu’ (representation) of the presiding deity,“ he said.This version is supported by crime branch DSP K Radhakrishnan Menon, who prepared a detailed stock of items in the temple and verified the quality of gold ornaments in 2014. “The assessment recorded in the CDB register regarding the purity of ornaments kept in the `kallara’ (strong room) is totally false,“ he said. 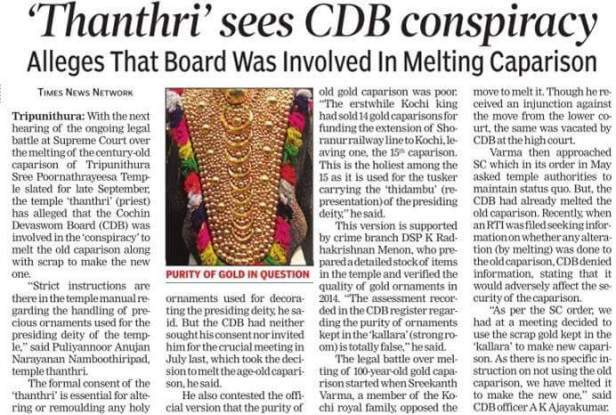 The legal battle over melting of 100-year-old gold caparison started when Sreekanth Varma, a member of the Kochi royal family , opposed the move to melt it. Though he received an injunction against the move from the lower court, the same was vacated by CDB at the high court. Varma then approached SC which in its order in May asked temple authorities to maintain status quo. But, the CDB had already melted the old caparison. Recently , when an RTI was filed seeking information on whether any alteration (by melting) was done to the old caparison, CDB denied information, stating that it would adversely affect the security of the caparison. “As per the SC order, we had at a meeting decided to use the scrap gold kept in the `kallara’ to make new caparison. As there is no specific instruction on not using the old caparison, we have melted it to make the new one,“ said CDB officer A K Ajayakumar.